Greek: Prosechete (2PPAM) apo ton pseudopropheton, oitines erchontai (3PPMI) pros humas en endhumasin probaton, esothen de eisin (3PPAI) lukoi arpages. KJV: Beware of false prophets, which come to you in sheep's clothing, but inwardly they are ravening wolves. Young's: 'But, take heed of the false prophets, who come unto you in sheep's clothing, and inwardly are ravening wolves. Spurgeon writes "Ahabs and Jezebels...will deceive you, if you are not divinely guarded against them." the Lord Jesus gives us a general warning against false teachers in the church. We are to "beware of false prophets." The connection between this passage and the preceding one is striking. Would we keep clear of this "broad way?" We must beware of false prophets. They will arise. They began in the days of the apostles. Even then the seeds of error were sown. They have appeared continually ever since. We must be prepared for them, and be on our guard. This is a warning which is much needed. There are thousands who seem ready to believe anything in religion if they hear it from an ordained minister. They forget that clergymen may err as much as laymen. They are not infallible. Their teaching must be weighed in the balance of Holy Scripture. They are to be followed and believed, so long as their doctrine agrees with the Bible, but not a minute longer. We are to try them "by their fruits." Sound doctrine and holy living are the marks of true prophets. Let us remember this. Our minister's mistakes will not excuse our own. "If the blind lead the blind, both will fall into the ditch." What is the best safe-guard against false teaching? Beyond all doubt the regular study of the word of God, with prayer for the teaching of the Holy Spirit. The Bible was given to be a lamp to our feet and a light to our path. (Psalm. 119:105.) The man who reads it aright will never be allowed greatly to err. It is neglect of the Bible which makes so many a prey to the first false teacher whom they hear. They would have us believe that "they are not learned, and do not pretend to have decided opinions." The plain truth is that they are lazy and idle about reading the Bible, and do not like the trouble of thinking for themselves. Nothing supplies false prophets with followers so much as spiritual sloth under a cloak of humility. Beware (4337) (prosecho from pros = before, toward + echo = hold) means literally to hold to, toward or before. Originally it was followed by the word "the mind" (nous) but at times "the mind" was omitted but still the idea of "the mind" was implied. To apply one’s self to. To attach one’s self to. Prosecho means to moor a ship, to tie it up. Prosecho was also used to mean “to remain on course”. Figuratively (see also below) the idea is to hold one's mind before then to take heed, to pay attention, to give heed, be in a state of alert, to watch out for or to be on guard. The word implies the giving one’s consent, as well as one’s attention. When used in this manner prosecho always warns of some type of danger (usually spiritual danger but occasionally physical)! Prosecho is not a call simply to notice or sense something, but to be on guard against it because it is so harmful (eg, the danger of practicing your righteousness for others to see, the danger of false prophets, false teachers and false teaching, the danger of the Pharisees and Sadducees). The idea is to turn one’s mind or attention to a thing by being on one’s guard against it. The present imperative calls for the wise citizen of the kingdom of heaven to be continually on the look out for false prophets especially those who promote the deadly deceptive "doctrine" of the wide gate and the wide way that leads to death and destruction (cp Mt 7:13, 14-note). Remember that a false teaching is the more dangerous the more truth it contains. And as someone well said an error no wider than a hair will lead a hundred miles away from the goal. Jesus' point is that not every who claims to belong to God and to speak for Him actually proclaims God's truth. His message speaks poignantly to the evangelical church in our day of shallow teaching which sets the saints up for false teaching! Watch out! The best antidote for the "arsenic" or leaven of false teaching is to teach sound doctrine (cp 2Ti 4:2-note, 2Ti 4:3, 4-note, Heb 5:14-note, Titus 1:9-note, 1Pe 2:2-note) As J C Ryle put it "Ignorance of the Scriptures is the root of all error." It is noteworthy that 12 of the 24 NT uses of prosecho are in the present imperative which is a command (see below) calling for continual attention! (1) To bring to, bring near, in Greek writings of bringing near a place, such as to bring a ship to land, and simply to touch at, put in. BDAG adds that "In non-biblical writings the primary meaning (is to) ‘have in close proximity to’; frequently... of mental processes ‘turn one’s mind to’." (2) To hold or turn one's mind toward a person or thing. To attend to, be attentive. To pay close attention to something. To give assent to. (of the crowds listening to Phillip = Acts 8:6, 10, 11) (Of Lydia paying attention and thus responding Acts 16:14) (Notice that the meanings #2 and #3 are related and some lexicons do not separate the meanings). (3) To be in a state of alert, be concerned about, care for, take care. The idea is to be in a continuous state of readiness to learn of any future danger, need, or error, and to respond appropriately. This meaning is frequently found as a command calling for continued attention (present imperative) - beware, be on alert, watch out, etc. (Mt 6:1, 7:15, 10:17, 16:6, 11, Lk 12:1, 17:3, 20:46, 21:34, Acts 5:38, 20:28, 1Ti 4:13) Notice also that it is Jesus Who is most often using this verb as a command! There is not enough left to make soup for a sick grasshopper. Prosecho - 24x in 24v - NAS = addicted(1), beware(8), give attention(1), giving...attention(1), giving attention(2), guard(3), officiated(1), pay attention(2), pay...attention(1), paying attention(2), respond(1), take care(1). Matthew 6:1-note "Beware (prosecho - present imperative = command to be continually on the alert!) of practicing your righteousness before men to be noticed by them; otherwise you have no reward with your Father who is in heaven. Matthew 7:15-note "Beware (prosecho - present imperative = command to be continually on the alert!) of the false prophets, who come to you in sheep's clothing, but inwardly are ravenous wolves. Matthew 10:17 "But beware (prosecho - present imperative = command to be continually on the alert!) of men, for they will hand you over to the courts and scourge you in their synagogues. Matthew 16:6 And Jesus said to them, "Watch out (horao - present imperative) and beware (prosecho - present imperative = command to be continually on the alert! A charge for constant watchfulness.) of the leaven of the Pharisees and Sadducees." Matthew 16:11 "How is it that you do not understand that I did not speak to you concerning bread? But beware (prosecho - present imperative = command to be continually on the alert!) of the leaven of the Pharisees and Sadducees." Matthew 16:12 Then they understood that He did not say to beware of the leaven of bread, but of the teaching of the Pharisees and Sadducees. Luke 12:1 Under these circumstances, after so many thousands of people had gathered together that they were stepping on one another, He began saying to His disciples first of all, "Beware (prosecho - present imperative = command to be continually on the alert! Calls for this to be one's continual attitude.) of the leaven of the Pharisees, which is hypocrisy. Luke 17:3 "Be on your guard! (prosecho - present imperative = command to be continually on the alert!) If your brother sins, rebuke him and if he repents, forgive him. Acts 5:35 And he said to them, "Men of Israel, take care (prosecho - present imperative = command to be continually carefully consider) what you propose to do with these men. Acts 8:6 The crowds with one accord were giving attention (imperfect tense = over and over) to what was said by Philip, as they heard and saw the signs which he was performing. Acts 8:10 and they all, from smallest to greatest, were giving attention (imperfect tense = over and over) to him, saying, "This man is what is called the Great Power of God." Acts 8:11 And they were giving him attention (imperfect tense = over and over. It pictures repeated action) because he had for a long time astonished them with his magic arts. Acts 16:14 A woman named Lydia, from the city of Thyatira (city in the province of Lydia in Asia Minor), a seller of purple fabrics, a worshiper of God, was listening and the Lord opened her heart to respond to the things spoken by Paul. Comment: The NET Bible notes that BDAG says prosecho here means "gives the meaning "pay attention to" here, (but that) this could be misunderstood by the modern English reader to mean merely listening intently. The following context, however, indicates that Lydia responded positively to Paul's message, so the verb here was translated "to respond." Acts 20:28 "Be on guard (prosecho - present imperative = command to be continually on the alert! This is to be your habitual attitude/action!) for yourselves (Note: Pastors, elders = first watch over your own heart and soul!) and for all the flock, among which the Holy Spirit has made you overseers, to shepherd the church of God which He purchased with His own blood. 1 Timothy 1:4 nor to pay attention to myths and endless genealogies, which give rise to mere speculation rather than furthering the administration of God which is by faith. 1 Timothy 4:13 Until I come, give attention to (prosecho - present imperative = command to be continually devote yourself to!) the public reading of Scripture, to exhortation and teaching. Titus 1:14 not paying attention to Jewish myths and commandments of men who turn away from the truth. Hebrews 2:1-note For this reason we must pay much closer attention to what we have heard, so that we do not drift away from it. Hebrews 7:13-note For the one concerning whom these things are spoken belongs to another tribe, from which no one has officiated (gave attendance, served) at the altar. 2 Peter 1:19-note So we have the prophetic word made more sure, to which you do well to pay attention as to a lamp shining in a dark place, until the day dawns and the morning star arises in your hearts. Genesis 4:5 but for Cain and for his offering He had no regard (Lxx = prosecho). So Cain became very angry and his countenance fell. Proverbs 4:20 My son, give attention (Lxx = prosecho - present imperative = command to be continually devote yourself to!) to my words; Incline your ear to my sayings. False prophets (5578) (pseudoprophetes from pseudes = false, untrue + prophetes = prophet) who teach any other way than that our Lord has clearly marked out in this passage. These men (1) claim to be a prophet from God and (2) utter falsehoods under the name of divine prophecies. The False Prophet is the second beast which John sees which comes up out of the earth having two horns like a lamb and who spoke like a dragon (Rev. 13:11-note). His appearance is benign, like that of a lamb, but his prophecies and commands have their source in the devil. This is why Scripture refers to him as the “False Prophet” (Rev. 19:20-note; Rev 20:10-note). The False Prophet performs great signs and miracles which are used to witness to the Beast from which he derives his power. “He exercises all the authority of the first beast in his presence and causes the earth and those who dwell in it to worship the first beast” (Rev. 13:12-note). He causes those on the earth to worship the Beast and to make an image to the beast (Rev. 13:14-note). He is even granted power “to give breath to the image of the beast” (Rev. 13:15-note). It appears that the miracles he performs are genuine, but what they attest to is false. It is the False Prophet who causes all men to receive a mark in order to be able to buy or sell (Rev. 13:16, 17-note). Along with the dragon and the Beast, he forms an anti-trinity wherein the dragon occupies a position like that of the Father, the Beast like that of the Son, and the False Prophet like that of the Holy Spirit, but testifies to the false son . All three are the source of demons which gather the kings of the earth to battle (Rev 16:13,14-note). (See Campaign of Armageddon) Both the False Prophet and the Beast are taken at the Second Coming of Christ and cast into the Lake of Fire as its first populace (Rev. 19:20-note). They are still there one thousand years later when joined by the devil (Rev. 20:10-note). False prophets are not just wrong but are very dangerous (cf "savage wolves" Acts 20:28, 29, 30), and one should not expose their minds (Remember: The battle is not as much physical as it is mental, so the battlefield is our mind and the great divine weapon is His Word and Sword of Truth, Ep 6:17-note, [2Co 6:7, Col 1:5-note, 2Ti 2:15-note, Jas 1:18-note]) to their false message because they inevitably pervert (Acts 20:30- where "perverse" = to turn or twist the truth throughout and) distort their listener's thinking and poison their souls. False prophets are more deadly than physical wolves and other predators, because they can kill not just the body but the soul. Matthew 7:15-note "Beware of the false prophets, who come to you in sheep's clothing, but inwardly are ravenous wolves. Matthew 24:11 "Many false prophets will arise and will mislead many. Matthew 24:24 "For false Christs and false prophets will arise and will show great signs and wonders, so as to mislead, if possible, even the elect. Mark 13:22 for false Christs and false prophets will arise, and will show signs and wonders, in order to lead astray, if possible, the elect. Luke 6:26 "Woe to you when all men speak well of you, for their fathers used to treat the false prophets in the same way. 2 Peter 2:1-note But false prophets also arose among the people, just as there will also be false teachers among you, who will secretly introduce destructive heresies, even denying the Master who bought them, bringing swift destruction upon themselves. Revelation 20:10-note And the devil who deceived them was thrown into the lake of fire and brimstone, where the beast and the false prophet are also and they will be tormented day and night forever and ever. These men claim to speak in His Name ("thus saith the Lord"), ostensibly setting forth the way of God, which in fact is not the true way but a pseudo-way which leads the listener away from God not to Him. The appear harmless like sheep, some of the most harmless animals known. Their inward character is that like insatiably hungry wolves who always seek to further their own interests at the expense of the flock. The outward appearance of these men belies their sinister inward character, which is why Jesus' next instruction in Mt 7:16 is so critical. They preach a so-called "gospel" of self-indulgence which is an utterly different message than Jesus proclaimed in the sermon on the mount. The gate of pride, of self-righteousness, and self-satisfaction is the wide gate of the world, not the narrow gate of God! False prophets use orthodox language, show biblical piety, and can be almost indistinguishable from true prophets. Since false prophets are so deceptive, how then can they be identified? The answer is that it is in the nature of false prophets to deceive and deny their true character. They can even deceive themselves, believing they are sheep when in fact they are ravenous wolves. They frequently disclose their true nature as ravenous wolves by what they do not affirm. In other words, they are identified not so much by what they say as by what they do not say. They say "Lord, Lord" and thus do not openly deny Jesus’ divinity, His substitutionary atonement, the depravity and lostness of man, the reality and penalty of sin, the destiny of hell for unbelievers, the need for repentance, humility, and submission to God, and other such “negative” and uncomfortable truths. They simply ignore them. Beware of such "prophets" is Jesus' resonating warning! False prophets includes those elsewhere referred to as false brothers (2Co 11:26), false apostles (2Co 11:13), false teachers (2Pe 2:1), false speakers, that is, liars (1Ti 4:2), false witnesses (Mt. 26:60), and false Christs (Mt 24:24). Sheep's clothing - Sheep, on account of their simplicity, mildness, inoffensiveness, patience and obedience, are used as emblems of believers in Christ. Since these false prophets resemble sheep they are more readily accepted into the "flock". When an enemy is seen for what he is, as are mocking, scoffing dogs and swine (Mt 7:6-note), "sheep" are alerted and wary, but when an enemy poses as one of "our own", then we drop our defenses. Ravenous (727) (harpax from harpazo [word study] = seize up, catch away) means grasping. This word was used to describe a certain kind of wolf and also for the grappling irons by which ships were boarded in naval battles. Harpax describes the spirit which grasps that to which it has no right with a kind of savage ferocity. The adjective harpax characterizes these false teachers as destructive, rapacious, grasping, robbing, greedy men. Keep your eyes open for this attitude in those who seek to be your spiritual leaders. Ravenous in English is the idea of very eager or greedy for food, satisfaction, or gratification. The English word implies excessive hunger and suggests violent or grasping methods of dealing with food or with whatever satisfies an appetite. Wolves (3074) (lukos) describes a literal wolf but here of course is used metaphorically of a rapacious (excessively grasping or covetous; living on prey and often suggests excessive and utterly selfish acquisitiveness or avarice), violent, "wolf-like" person. In Palestine, wolves were the most common natural enemy of sheep. They were known for being merciless and ferocious. They roamed the hills and valleys, looking for a sheep that strayed away from the flock or lagged behind. When a wolf found such a sheep it quickly attacked and tore it to pieces. Even a grown, healthy sheep was utterly defenseless against a clever, wily wolf. How To Catch A Rat - My grandson's chicken coop was invaded by rats. Attracted by the feed, they had moved in. He asked for my help and we set out a couple of traps. After a week, though, we had not caught a single one. Then a farmer friend offered some advice. "No rat," he said, "will touch an exposed trap. You must disguise it with food. Fill a pan with meal and place the trap in it. Cover it well with meal so it is completely hidden." It worked! The next morning we had a big fat rat. All this reminded me that the devil knows this trick too. He carefully disguises his trap with truth. Nowhere is it better seen than in the numerous false cults and religions in the world today. All set their traps of error in a pan of meal. Many quote the Bible and preach a certain amount of gospel truth. They talk about prayer and Jesus and the Bible. But under the layer of truth is the trap of error. Wherever God sows His wheat! —Anon. Satan often disguises error with a veneer of truth. Greek: apo ton karpon auton epignosesthe (2PFMI) autous; meti sullegousin (3PPAI) apo akanthon staphulas e apo tribolon suka? KJV: Ye shall know them by their fruits. Do men gather grapes of thorns, or figs of thistles? Young's: From their fruits ye shall know them; do men gather from thorns grapes? or from thistles figs? Jesus now addresses how His followers can recognize these false teachers. Spurgeon - How? By their eloquence? No. Some of the worst of teachers have had great persuasiveness. You shall know them by their earnestness? No. Some have compassed sea and land to make proselytes to a lie. You shall know them how, then? ;If their teaching makes you better, if it makes you love God, if it draws you to holiness, if it inspires you with noble and heroic sentiments, so that you imitate Christ, then listen to them. Know (1921) (epiginosko from epi = intensifies meaning of + ginosko = know by experience) means to fully know them or be fully acquainted with. False doctrine cannot restrain the flesh, so false prophets will always eventually manifest the innate wickedness of their hearts. (2Pe 2:1-see notes on false teachers beginning in 2Pe 2:1). The conduct of one's life is the true mirror of one's doctrine. As Vincent says "Character is satisfactorily tested by its fruits." Remember however that character and reputation are not synonymous, because reputation is what men think you are while character is what God knows you are. Character is like a tree and reputation its shadow. The shadow is what we think of it; the tree is the real thing. If we would judge rightly of any man we must see how he bears good and bad fortune. Our behaviour in times of need and crisis proclaims what we really are. The Lord knows them that are his by name, but we must know them by their character. Daylight can be seen through very small holes, so little things will illustrate a person's character. The actions of men form an infallible index of their character. A man's heart is what he is. Orthodoxy of words is blasphemy unless it is backed up by superiority of character. Fruit trees may be beautiful but they have as their primary purpose the bearing of fruit, and so they are judged not by looks but by fruit produced. Jesus is saying that in the same way a prophet or anyone who speaks for God is to be judged by his life and not just by his lips (words). Just as a genuine fruit tree cannot keep from being revealed by its fruit, the nature of the prophet cannot help being revealed. Jesus is making it quite clear that although false prophets will come, we do not have to be deceived by them but we can in fact accurately identify them if we look closely at their "fruit". On the other hand, the implication is that if genuine believers fail to look closely at the "fruit" of a prophet's life, they can be ensnared by them. There are many who would try to guide us along the broad path that leads to destruction; how can we guard ourselves against them? We guard ourselves against false prophets by taking heed to their fruits. This means paying attention to many aspects of their life and ministry. We should pay attention to the manner of living a teacher shows. Do they show righteousness, humility and faithfulness in the way they live? We should pay attention to the content of their teaching. Is it true fruit from God's Word, or is it man-centered, appealing to ears that want to be tickled? We should pay attention to the effect of their teaching. Are people growing in Jesus or merely being entertained, and eventually falling away? Fruits (2590) (karpos) in this context refers to one's manner of life or what a person does. Although karpos can refer to one's words (cf Mt 12:33, 34, 35, 36, 37), here karpos refers more to who the individuals are and how they behave, for they can say the right things and deceive saints who have not obeyed Jesus' command to be continually on guard (Mt 7:15). Character is satisfactorily tested by its fruits. It is not the outward appearance that is important, but the things these false prophets do, the produce so to speak of their thought, words and deeds. Good fruit proves that the tree from which it came is healthy. Worthless fruit shows that the tree from which it fell is sickly. This cannot be otherwise. What a man is in his inner being comes to expression outwardly, especially in words and deeds...character reveals itself. To be sure, the false prophet may be able for a little while to deceive people, and to hide his real face behind a mask of seemingly pious words and deeds. This cannot last. “Nothing is more difficult than to counterfeit virtue” (Calvin). The fruit will show the true character of the tree. Do their lives demonstrate the power of godliness (2Ti 3:5-note). Do their disciples exemplify a heart for holiness and a persevering faith (Hebrews 3:14-note). An art enthusiast displayed on the walls of his office a collection of etchings, including one of the Leaning Tower of Pisa. Every morning he noticed it was crooked, so he straightened it. Finally one evening he asked the cleaning woman if she was responsible for moving the picture each night. "Why, yes," she said, "I have to hang it crooked to make the tower straight!" In a similar way, some people have the habit of twisting the Scriptures to make their imperfect lives look better or to justify their own opinions. Jesus warns us about the kind of people who do not approach God's Word with honest motives and respect for its authority, and who consequently distort and twist the truth. In summary, we need to beware of their manner of living and whether they show righteousness, humility and faithfulness in the way they live. We obviously need to be wary of the content of their teaching, especially does it square with God's Word, or is it sensationalist, feelings oriented, emotional, man-centered or appealing to ears that want to be tickled. Finally we need to pay attention to the effect of their teaching and whether or not people are growing in grace and the knowledge of our Lord Jesus Christ or whether they are merely being entertained, and eventually fall away. Though it may take time for the harvest to ripen, the fruit, whether good or bad will become evident and reveal the character of "tree" they are. False prophets can also be identified by the character of their converts and followers. Their followers will be like them in that they are egotistical, proud, self-centered, self-indulgent, self-willed, and self-satisfied, while being religious. They will be both self-oriented and group-oriented, but never God-oriented or Scripture-oriented. “The prophets prophesy falsely, and the priests rule on their own authority and My people love it so!” (Jeremiah 5:30-31;). “The prophets are prophesying falsehood in My name. I have neither sent them nor commanded them nor spoken to them; they are prophesying to you a false vision, divination, futility and the deception of their own minds” (Jeremiah 14:14). “Also among the prophets of Jerusalem I have seen a horrible thing: the committing of adultery and walking in falsehood, and they strengthen the hands of evildoers, so that no one has turned back from his wickedness. All of them have become to Me like Sodom, And her inhabitants like Gomorrah. 15 "Therefore thus says the LORD of hosts concerning the prophets, 'Behold, I am going to feed them wormwood and make them drink poisonous water, for from the prophets of Jerusalem pollution has gone forth into all the land.'" 18 "But who has stood in the council of the LORD, that he should see and hear His word? Who has given heed to His word and listened? 19 "Behold, the storm of the LORD has gone forth in wrath, Even a whirling tempest; It will swirl down on the head of the wicked. 20 "The anger of the LORD will not turn back Until He has performed and carried out the purposes of His heart; In the last days you will clearly understand it. 21 "I did not send these prophets, But they ran. I did not speak to them, But they prophesied. 22 "But if they had stood in My council, Then they would have announced My words to My people, And would have turned them back from their evil way And from the evil of their deeds. 23 "Am I a God who is near," declares the LORD, "And not a God far off? 24 "Can a man hide himself in hiding places, So I do not see him?" declares the LORD. "Do I not fill the heavens and the earth?" declares the LORD. 25 "I have heard what the prophets have said who prophesy falsely in My name, saying, 'I had a dream, I had a dream!' 26 "How long? Is there anything in the hearts of the prophets who prophesy falsehood, even these prophets of the deception of their own heart, 27 who intend to make My people forget My name by their dreams which they relate to one another, just as their fathers forgot My name because of Baal? 28 "The prophet who has a dream may relate his dream, but let him who has My word speak My word in truth. What does straw have in common with grain?" declares the LORD. 29 "Is not My word like fire?" declares the LORD, "and like a hammer which shatters a rock? 30 "Therefore behold, I am against the prophets," declares the LORD, "who steal My words from each other. 31 "Behold, I am against the prophets," declares the LORD, "who use their tongues and declare, 'The Lord declares.' 32 "Behold, I am against those who have prophesied false dreams," declares the LORD, "and related them, and led My people astray by their falsehoods and reckless boasting yet I did not send them or command them, nor do they furnish this people the slightest benefit," declares the LORD. Know them by their fruits - THE renowned artist Paul Gustave Dore (1832-1883) lost his passport while traveling in Europe. When he came to a border crossing, he explained his predicament to one of the guards. Giving his name to the official, Dore hoped he would be recognized and allowed to pass. The guard, however, said that many people attempted to cross the border by claiming to be persons they were not. Dore insisted that he was the man he claimed to be. "All right," said the official, "we'll give you a test, and if you pass it we'll allow you to go through." Handing Dore a pencil and a sheet of paper, the official told the artist to sketch several peasants standing nearby. Dore did it so quickly and skillfully that the guard was convinced Dore was indeed who he claimed to be. His work confirmed his word! THE greater part of our Lord’s Sermon on the Mount was intended to counteract the errors of the Pharisees, and the false glosses by which they had obscured the law of Moses. But, in the words before us, our Lord seems to have intended to counteract the general influence of the Pharisees. They were in high repute for sanctity among the people, even whilst they were filled with all manner of malignant passions. They pretended to have a high regard for religion; but they were, in fact, the bitterest enemies of all vital godliness. 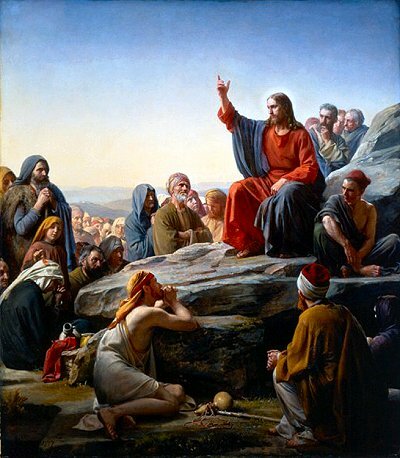 It was of great importance that the followers of Christ should know how to distinguish them: and for that purpose our Lord gave them a rule which, in its use and application, was easy, certain, and universal. [Twice is it repeated, “By their fruits ye shall know them.” We should inquire, What is the fruit of their doctrine upon themselves and on their hearers? If the people themselves be proud, worldly, covetous, and despisers of real piety, we have no reason to think that they will ever produce the opposite dispositions in us. If they be resting on a wrong foundation themselves, they are not likely to build us up upon that which God has laid in Zion. If they be disputatious, contentious, ambitious of pre-eminence among their fellows, they are not calculated to be useful to us in bringing us to a meek, humble, and heavenly frame.